Thank you for your letter. We are happy that Washington liked the performance so much. We liked Washington. In your letter you were kind enough to say that we had sacrificed both time and effort. There has been no sacrifice on our part. We know that what we are doing is our duty and obligation. Because of the nature of the expedition we are fully aware of the difficulties involved. We expect to be pushed around and we will be disappointed a little if we aren't. We know, too, that what we are doing is a privilege rarely granted to citizens of this country. We are deeply appreciative of the opportunity and our only regret is that we are not playing more cities and towns. We are proud to be permitted to contribute to this truly noble cause for we are all cognizant of the great sacrificial effort the men in the armed forces are making for all of us, to bring victory -- the victory which we must have -- we will have. Besides being signed by Stan Laurel, this letter was also signed by Desi Arnaz, Joan Bennet, Charles Boyer, Jim Cagney, Cary Grant, Oliver Hardy, Bert Lahr, Groucho Marx and Pat O'Brien among others. Laurel and Hardy made a stop in Milwaukee, Wisconsin on their “Hollywood Caravan to Victory” tour in May 1942. 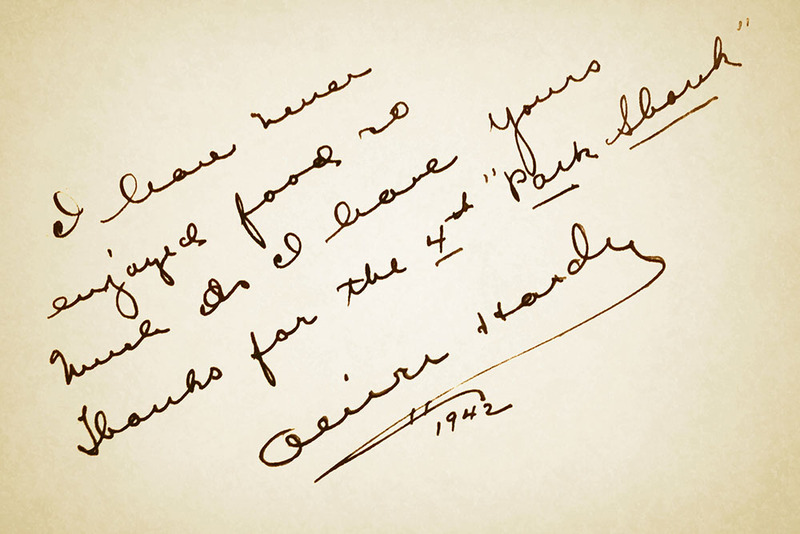 Hardy wrote this note for his hosts at Mader’s Restauarant for their “Hall of Fame” wall writing: “I have never enjoyed food so much as I have yours. Thanks for the 4th ‘Pork Shank.’ Oliver Hardy, 1942” — Opened un 1902, Mader’s Restaurant is noted for being the most famous German restaurant in North America.